Hallelujah! After substituting an external 32768 Hz crystal as the timer clock source for my hiking data logger, I’ve reduced the sleep mode (LCD off) supply current to less than 0.01 mA! It’s actually below the resolution of my multimeter– the meter just reads zero. Previously I was using the microcontroller’s internal clock as the timer clock source, which required it to keep running during sleep mode, and resulted in a sleep supply current of 0.11 mA. 0.01 mA: that is one small number. 10 microamps! It’s hard to believe a real circuit can run on that little current. Gotta love these AVR microcontrollers. 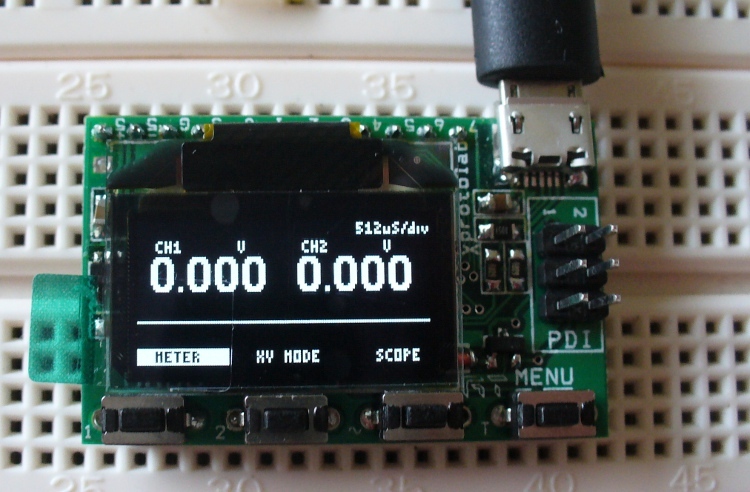 When “on”, with the LCD enabled and the user pressing buttons, the supply current is 0.41 mA without the backlight, or 1.2 mA with the backlight. Every time a new pressure/temperature sample is taken (once a minute or so), there’s an additional short current spike of about 0.15 mA above the baseline. How short, I’m not sure, but probably less than 50 ms according to the datasheet. Assuming the logger is fully powered with LCD and backlight for about 15 minutes a day, that’s about 1% of the day in high power 1.2 mA mode, and 99% in low power 0.01 mA mode. That’s an overall average current of about 0.02 mA or 20 microamps. At that rate, a CR2032 coin cell with typical 220 mAh capacity will have a battery life of more than a year. So have you figured out a case yet? Thanks! For the case I’ll probably get something custom laser cut. Pokono does cusotm acrylic laser cutting for $2/min of laser time. It won’t be water-tight, but it should protect against most bumps and drips. I’m also daydreaming about logger version 2, with a high-resolution (yet physically smaller) OLED screen, and an accelerometer. That would probably need an AAA battery instead of the CR2032 coin cell, or something else with a bit more oomph.